If you have been wanting to kiss the sun; and if you have been dreaming of having a grand vacation in a heavenly paradise without spending that much, Krapets is for you. This place is known for its exceptional scenery and wonderful bodies of water. Definitely, spending your holidays in this site would make you feel relaxed and would surely allow you to temporarily escape from the stress of the workplace. Know more about what Krapets has to offer by reading its description and other important information below. Krapets (A.K.A. 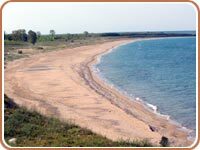 Krapec) is a small seaside village, located 10 km north of Shabla, about 90 km from the nearest airport of Varna at the end of an access road that hugs the Black Sea coast. It is a quiet place known for its dunes and bird life. The village is perched on the beach, surrounded by vast wheat and sunflower fields and wild nature reserves. The area of Krapets is a low plateau, slightly elevated and inclined towards the sea. The Black sea coast is low, combination of ochre cliff sections and beach strips with sand dunes. The native people are merry, friendly and show their hospitality to every visitor at the village. Many guests of Krapec have tasted the famous local specialty - Fish broth. The main occupation of the natives is growing vegetables, farming and fishing. 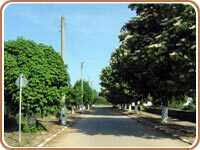 The village is usually quiet and sleepy, unless you happen to be there on the Day of Bulgarian culture and the Slavonic Script (May 24th). This day the village meets their guests and turns out for festive folk-singing and dancing. The atmosphere in this little-visited part of the coast seems to be world away from the packed beaches of Varna, Golden Sands, Sunny Beach and Albena. Locked in rural solitude, it's an ideal place to get away from it all. The village is surrounded by one of the largest and finest beaches (length>6 km.) on the Bulgarian seaside. The sand dunes and the beach are remarkably undeveloped, and the whole gem of place maintains its wilderness and authenticity. The Hellenes used to name the Black sea Pontus Euxinus, amiable sea. And its true that the Black sea near Krapets is amiable and hospitable: calm and pure, without ebb-tide, without dangerous fishes, with fine sandy bottom. 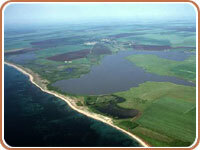 Just a kilometer northeast of Krapets is a fish-rich Durankulak lake. It attracts fishing fans with plenty of Pike-perch, Carp, Catfish, Bream, Crucian carp, Rudd, and even European eel. The lake, with semi-salty water and swamp flora, is surrounded by steppe vegetation. On the narrow strip separating it from the sea is the sand-dune hugging plant life. It is famous for being a reserve for a number of marsh birds, some of them are registered in the Red Book of the fauna species in Bulgaria. On the big island in the Durankulak lake is discovered the temple of Kibela - the oldest prehistoric necropolis in continental Europe. Nearby remains of the ancient Eneolithic settlement (existed from 5400 to 4100 B.C) were excavated. Excavation has also revealed many other finds dating back to various periods of human civilization. All archaeological finds can be seen in Historical Museum of Dobrich. Between Krapets and cape Shabla is situated a landscape of deserted beaches and crumbling ochre cliffs that carries on for kilometers. Nearby the town of Shabla is the yachting club where the annual yacht-regatta along the Black Sea coast starts. In Krapets you will not find tens of All Inclusive hotels, however, there is plenty of accommodation available. There are around thirty hotels, guest houses, separate villas and lodgings scattered in the village. The prices and conditions are far from those of luxury hotels in popular resorts, but still they will satisfy those who seek tranquility and want to be close to nature. Krapets is connected with Varna and Dobrich via Shabla by daily bus transport. The road to Varna is a first-class one and leads to the Romanian border northwards. In addition there is a daily bus from Sofia to the nearest town of Shabla. Copyright © Krapets.com 2005 -2014 All Rights reserved.